The Eberhard watch company was founded at La Chaux-de-Fonds, Switzerland, in 1887 as the Maison d’Horlogerie Eberhard & Co. With a history of well over 125 years, its name has stood its ground ever since as a synonym for tradition, commitment and innovation. 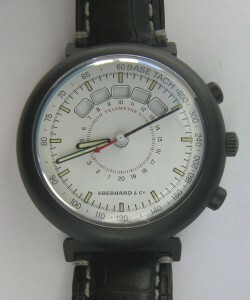 In the 1980’s Eberhard launched their regatta watch with the Valjoux 7757 movement. 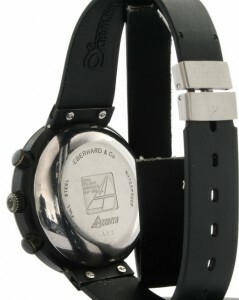 Eberhard Azzurra Regatta in different versions. 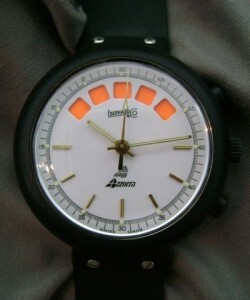 Reference: 31700 with steel case and black rubber strap. Limited to 650 pieces. 31700 with steel ‘Oxide Noir’ case and black rubber strap. Limited to 100 pieces. 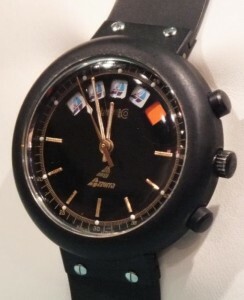 31701 with titanium case and black rubber strap. Limited to 250 pieces. Case size: Ø 38,6 mm / H 14,2 mm (above version). 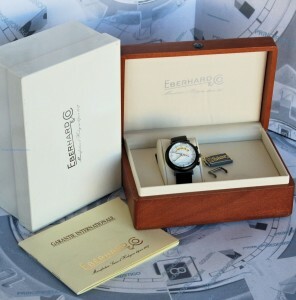 Two times Eberhard Azzurra Regatta with original box and papers. There is not so much to find about these Eberhard regatta models. 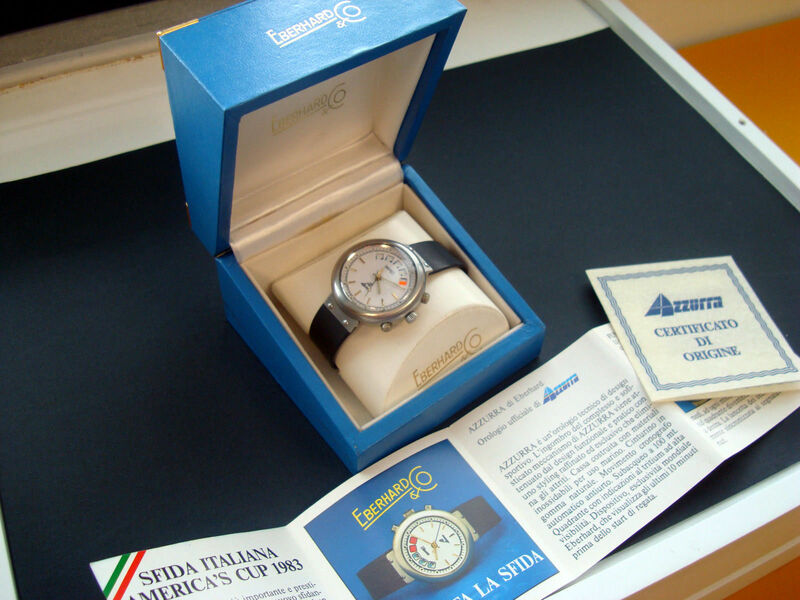 On the caseback of both versions it says: Azzurra – Sfida Italiana America’s Cup 1983 (Sfida means Challenge in English). In 1983 Italy made a spectacular entrance to the America’s Cup arena in Newport, with their elegant 12-metre Azzurra. ‘Sfida Italiana America’s Cup 1983’ was the name of the consortium owning the Azzurra. And probably these watches were released in honour to the Italian yacht, and given to the Italien crew members. 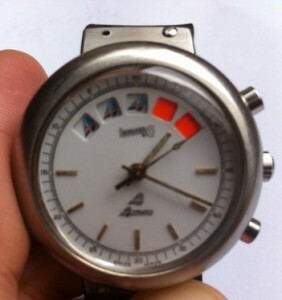 The watches are numbered with an engraving on the caseback (eg B 125). We know that the Valjoux 7757 regatta movement was used in the 1980’s for the Atlantic Skipper , the Eberhard Azzurra Regatta , the Memosail Automatic and the Wyler Vetta La Giraglia . But who came first? The movement was developed for Valjoux by Dubois-Depráz, but which watch brand triggered them to do this? 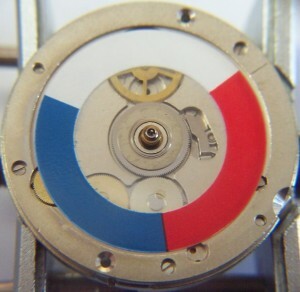 Indicator disk in the Eberhard Azzurra Regatta and Wyler Vetta La Giraglia (left) and in the Memosail Automatic and Atlantic Skipper (right). 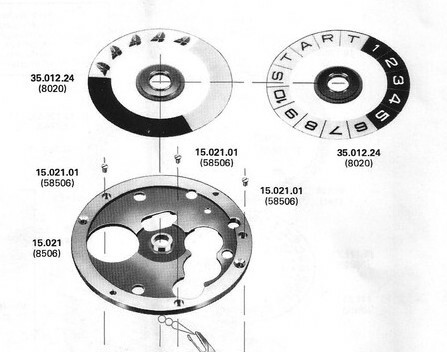 Looking at the technical documentation of the caliber Valjoux 7757 you will see that there are two indicator disks shown, both with the same part number 35.012.24 (8020). The first one is obvious the one in the Eberhard Azzurra Regatta; the second one is the disk in the Wyler Vetta La Giraglia. Both the Memosail Automatic and the Atlantic Skipper use an indicator disk with only colours (as in the Lemania 1345 movement). 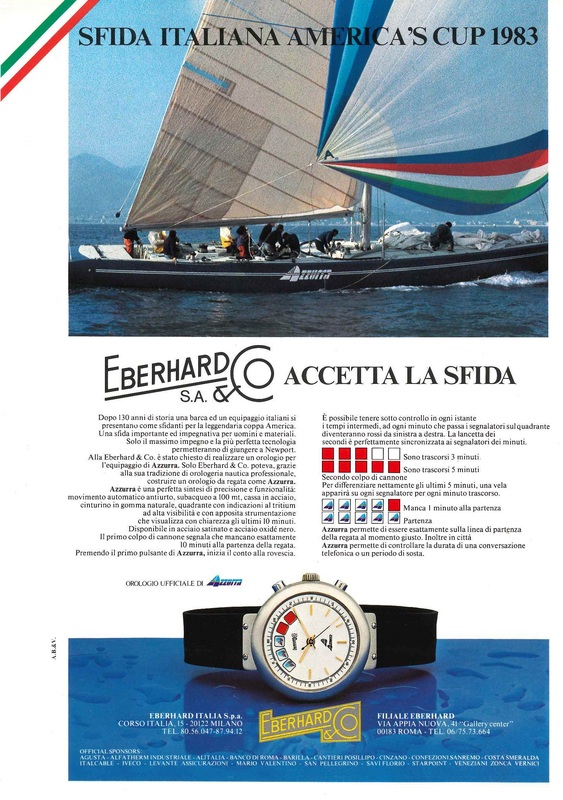 As the Eberhard version was specificly released for the America’s Cup in 1983, for me it sounds logical they were the one starting the development! And probably Wyler Vetta followed shortly after. 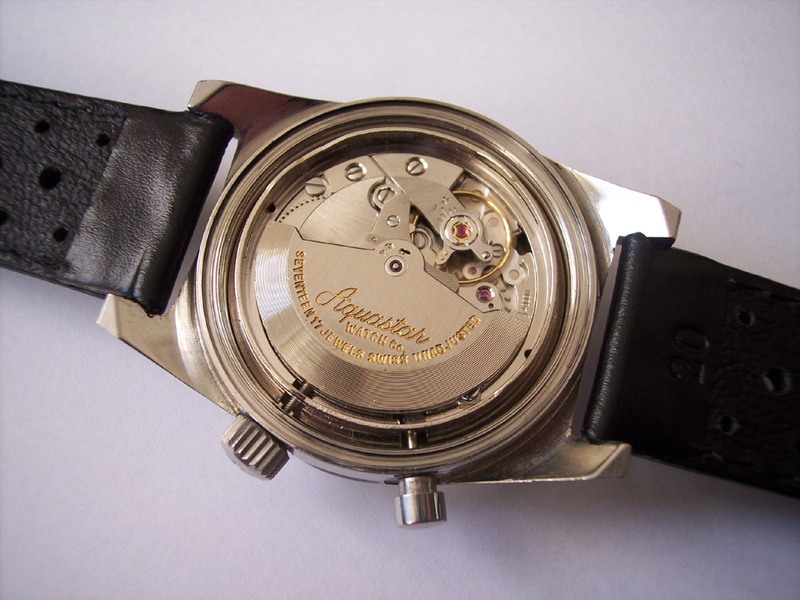 For a further description of the Valjoux 7757 movement please refer to the Atlantic section. ‘In 1982, Luca Cordero di Montezemolo (former chairman and president of Ferrari, current chairman of Alitalia airlines) along with Giovanni Agnelli (former Chairman of Fiat) Aga Khan IV (one of the 10 richest royals in the world according to Forbes) set out to fund, assemble, and manage a team with the sole focus to challenge American dominance in sailing which had dated all the way back to 1851 and bring national pride to Italy. 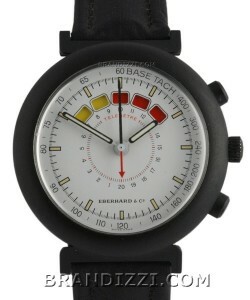 Many thanks to Robert Kondilas for your information about the team watches. Many thanks to Bettina Göttsche and the whole Eberhard & Co team for all the given information and pictures.